It used to be automakers revealed new concept vehicles primarily at consumer auto shows during press days. Then came the Consumer Electronics Show in Las Vegas, which increasingly has been stealing thunder in recent years, particularly from Detroit’s North American International Auto Show, which it practically overlaps. The hot new venue for reveals appears to be the legendary Concours d’Elegance in Pebble Beach, California. The show and competition among the historic vehicles will take place Sunday, but the lead-up includes marketing opportunities for automakers. You would be hard-pressed to find a more affluent group of consumers than owners and attendees at the show, where the ticket price starts at about $500 per person. Most come in early for other auto-related events during Monterey Car Week, such as another auto competition and party at The Quail. 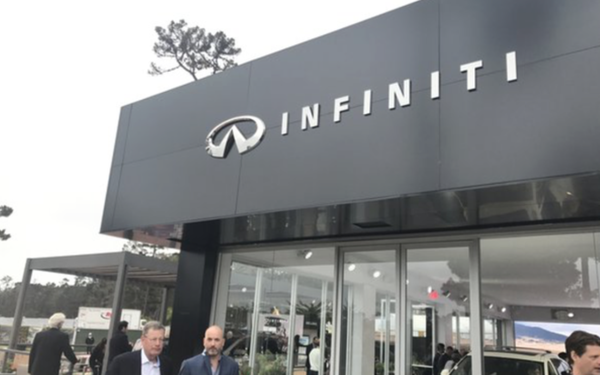 Several automakers set up activations there, including Infiniti. Motor Trend Group is orchestrating a chorus of events for Nissan’s luxury nameplate, including the inaugural Japanese Automotive Invitational. That event aims to bring even more diversity to the premiere celebration of classic, vintage automobiles and demonstrate the prowess Japan brings to the industry, according to Infiniti. Motor Trend is also carrying live coverage of Sunday’s activities, including a live stream of the awards presentation. Today, Infiniti unveiled the Infiniti Prototype 10. The concept vehicle aims to recapture the spirit of early speedsters for an era of electrified performance. BMW also unveiled the 2019 BMW Z4 M40i First Edition, the latest BMW Z Roadster, which dates back to the late '80s. The company chose the same location as was picked for the reveal of the BMW Concept Z4 last year. It's also the location at Pebble Beach where the winner of Sunday’s competition will receive Best in Show. Ford has a product reveal Friday afternoon for a new vehicle not yet announced. Its luxury division, The Lincoln Motor Company, is the Automotive Fine Arts Society sponsor but has no reveals. Acura is revealing an unspecified vehicle tonight. Honda’s luxury nameplate also is displaying the Acura ARX-05 prototype race car on the Pebble Beach Concours d’Elegance Concept Lawn on Sunday. The ARX-05 marks the brand’s anticipated return to endurance prototype racing, which Acura began more than 25 years ago in 1991. Alfa Romeo, always omnipresent at many of the week’s events, is hosting a VIP gathering at a winery in Carmel on Friday night. Orchestrated by Motor Trend Group, the gathering is attracting influencers like Arie Luyendyk of "The Bachelor," who is also a race car driver. Last year, over the course of the week, the automaker captured over 1,400 leads. Besides the show on Sunday, another big draw is the Rolex Monterey Motorsports Reunion at nearby Laguna Seca Raceway. Mazda gave up naming rights at the facility earlier this year. It is now known as WeatherTech Raceway at Laguna Seca. The automotive-accessories company now has naming rights in a five-year, $5 million deal. Mazda will continue some sponsorship through 2018 and 2019, including the Rolex reunion. The watchmaker continues to support the Rolex Monterey Motorsports Reunion, with a four-year naming agreement announced earlier this year.